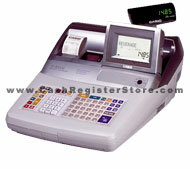 Casio TE-3000 Electronic Cash Registers at Cash Register Store. The Casio TE-3000SS features a base of 5,000 plu's and can easily be upgraded to 25,000 scanning plu's with a memory upgrade. A Metrologic MS-9520 laser scanner is standard with the package. There are many outstanding features which include a tiltable 5.2 inch wide color LCD screen with 2 lines x 16 characters and a 1 line numeric operator display offer the customer a clear view of transaction information. Choose from 5 selectable colors for the LCD display. This LCD screen displays characters larger than any other cash register system which is great for people with limited vision. The keyboard is very expansive for a raised keyboard cash register. There are 30 department/plu keys offering more them most brands and models on the market.